Today’s recipe was given to me by a really good cook named Pat. She bakes her chocolate chip bars in a 15×10 inch pan, but you can also make half the recipe and use a 13×9 inch pan. I made a half batch version and it was done in 20 minutes. The bars came out of the oven a little cakey, then settled into dense, firm-but-moist bars. They’re loaded with chocolate chips and that is something I would not change. The nuts are a good addition, but you can leave them out if you want. Cream the butter and sugars, beat in the eggs and vanilla.. Combine the dry ingredients and blend in. Add chips and nuts. Spread in a greased 15x 10 inch baking pan. Bake at 350F (176 C) for 15-20 minutes. Cool and cut into bars. (Anna's Note -- My half batch took about 20 minutes, Janet's full batch took 30, so watch the bars and check at 20 minutes. Brown sugar usually weights between 7 or 8 oz per cup depending on whether it’s dark or light, what brand it is, how much moisture there is, etc. It’s hard to say exactly, so I usually go with 7 or 7 1/2 o. 7 1/2 times 28 is 210 grams. It really depends on the recipe. For anyone who doesn’t understand how volume and weight work, 1 cup volume is 8 oz. The weight of 1 cup of brown sugar is 7 or 7 1/2 or sometimes 8 oz. To get the amount of grams, you multiply whatever the weight is by 28 because there are 28 grams in an ounce. About to try this recipe, but I have a question about amounts: is it 1 cup of brown sugar (isn’t that about 220 grams) or 50 grams? Thanks so much! Angie, thanks for the review! I hope your co-workers like them. Yum! I’ll have to make these next month for my Angel Baker troop! OMG! These bars are wonderful! Could hardly wait until they were cooled to cut them….many thanks to you and Pat for sharing the recipe! I was skeptical of ALL the chips but it wasn’t too many. Thanks for this. I’m always looking for goodies that keep well in the mail. Thank you for thinking of the troops! When my husband was in Iraq someone told me to put a piece of white bread in with the cookies I sent – the moisture from the bread is absorbed into the cookies, helping to keep the cookies from becoming dry. I did a test run, and it was in fact very helpful, the bread was as hard as a rock, but the cookies were very fresh. Again, thanks for supporting our troops!! MMmmm another must-steal recipe thhhxx ^^! these look good!! I love looking at your site. It’s the only way I’m getting my chocolate “fix” since I’m 13 weeks pregnant!! 😉 By the way, I love the pictures of Lizzie. She’s adorable! This recipe looks like one that will become one of my favorites (love all those chocolate chips). More importantly, thank you for thinking of the troops, baking for them and sending them something special. My brother was a marine and did two tours in Iraq. Packages from families are great. Special gifts – like these cookie bars are wonderful for them. Just wanted to thank you for thinking of them. They look great. You’ll have to let me know how they are 5 days from now and maybe I’ll make those for shipping to troops, too. 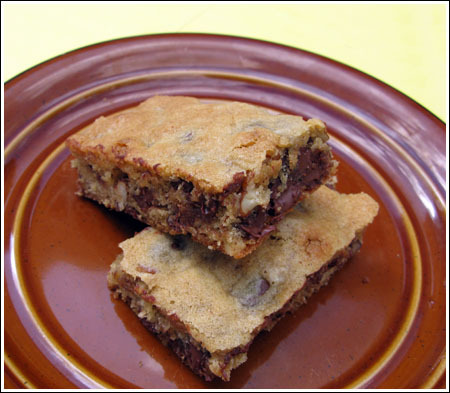 OH, these looks and sound like blondies, one of my favorite bars ever! !